Our Wolof Primer employs state-of-the-art Internet technologies to deliver a fun and easy learning experience. Special emphasis is placed on teaching the everyday words and phrases that a tourist would find invaluable in Senegal or The Gambia. Please keep in mind that our Wolof Primer is not a full, college level course. Most Wolof speaking people would agree that Wolof is a very difficult language to teach. It's complexity and lack of tight conventions are two of many reasons why many Wolofs feel that Wolof is simply unteachable -- even to those eager to learn. This website is the result of our resolve to prove all the nay-sayers wrong! We believe that the world deserves a website devoted to this most unique and beautiful language. Click here to try one of our online course modules, to read more about the online primer and to join the Wolof Online experience. Wolof is spoken/used in the following countries: Gambia, Mauritania, Senegal. Language family: Family: Niger-Congo; Subgroup: Western Sudanic; Branch: West Atlantic. 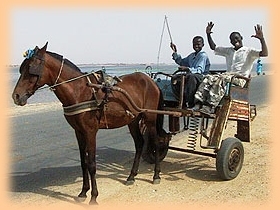 Senegal is the westernmost nation in West Africa. French is the "official" language, but most people speak Wolof. The Wolof people make up more than one-third of Senegal's population, and have been the dominant group in the region for generations. They have developed a rich cultural tradition which is marked by their hospitality and willingness to include outsiders. Their culture has embraced the Muslim religion since the 10th century. A century of Christian mission effort has had little impact, and there are only a few Wolof believers. About 80 percent of the Senegalese population speaks Wolof. The Republic of Senegal is home to more than 3 million Wolof people along with the Fulani, Serer, Toucouleur, Diola and Mandingo people groups. 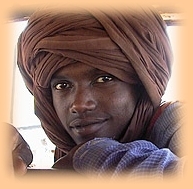 Islam is the dominant religion of the Wolof people; The Wolof conversion to Islam began in the 11th century and today the vast majority of Wolofs are Muslims. you can save lots of money by using a online calling card . Images copyright © 1999 Mark Davies. A special thanks to Fabio Agnolon, Tami Zezulka, Carla Eugnene, 'Mustic' and Mark Davies for their contributions to this website.